Ideal for high speed production lines. It delivers high quality codes at production speeds of more than 120 impression / minute 200 impression / minute (250 imps / min) with multiple line code printing. Automatic feeding by slant magazine allows labels to a polished stainless steel feed wheel, The Label is picked up by rubber and it is fed to a timing chain, which carries the label under the printing head. Printing head is having a type block where individual types can be composed, or rubber stereos can be fixed on a block of half cylinder piece. No make ready or skill is involved, as the rubber backup cylinder evens out the impression. 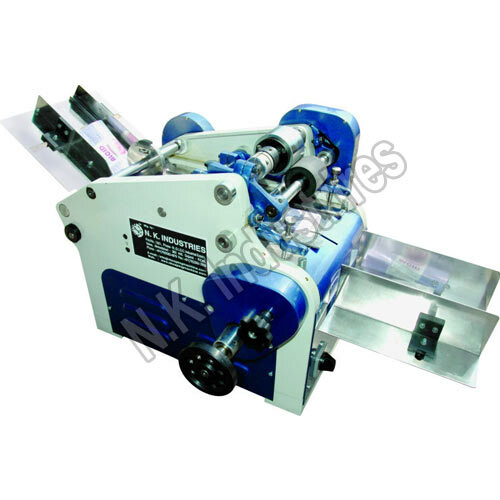 Oscillating distributor roller spreads ink evenly shaded unbroken, fully to the ink roll. All shafts of Stainless Steel materials rotate in sintered bronze bushing (oil-less bushes). Other major parts are also stainless steel material. 0.25 HP /1440RPM/414 V 3Phase & Single Phase.